On August 19th 1969 a commissioning ceremony took place for No700S Naval Air Squadron at the Royal Naval Air Station, Culdrose. 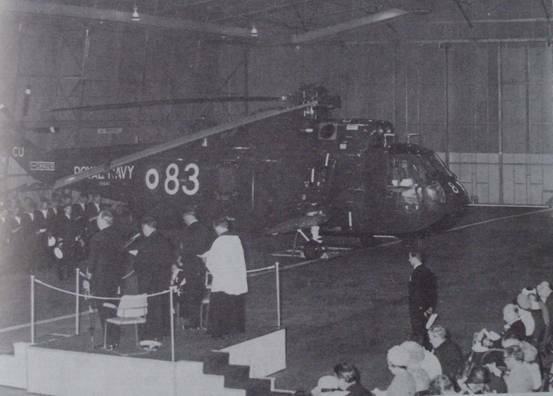 This event marked the entry into service for the Sea King helicopter and the beginning of a long association with the Fleet Air Arm. The Commanding Officer at the centre of the time honoured ceremonial that day, was Lt Cdr V. Sirett, his Senior Observer was Lt Cdr J Flindell, their task was to form the Intensive Flying Trials Unit for the Sea King HAS Mk1 helicopter and bring it into front line service with the fleet. The successful completion of the IFTU gave the Royal Navy an effective hunter-killer helicopter, with twin engined reliability and prolonged time on station which, was to set the pattern for at least two decades and probably into the foreseeable future. The acceptance of helicopters as useful front line aircraft in the service inventory with the British Services was a slow process. During the fifteen years from 1945 to 1960 the Royal Navy became aware that the rotorcraft placed in their hands, were an effective maritime weapon. 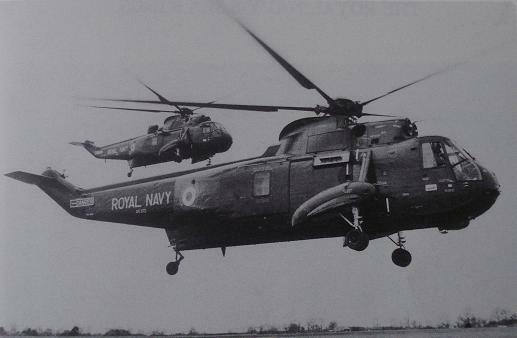 Westland Helicopters played a significant part in the transformation progressing from the somewhat primitive Dragonfly, through to the Wessex which was able to perform effectively in the anti submarine role, search and rescue and also the commando role. 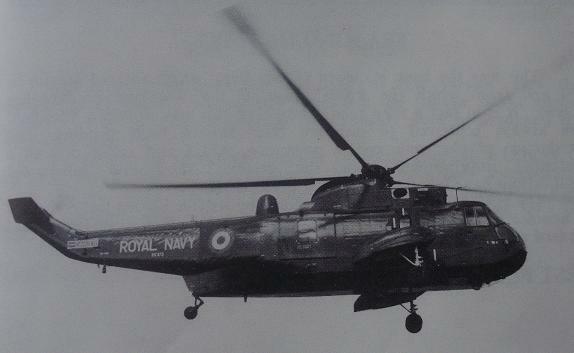 Soon after the first flight of the Sikorsky HSS 2 in 1959, Westland concluded a licence agreement with Sikorsky to use the basic airframe and transmission to develop an anti submarine helicopter for the Royal Navy. This foresight did not bear fruit until well into the 1960’s, this being the time necessary for the reflexes of the UK procurement system to accept, that there may indeed be an urgent need for a twin-engined hunter-killer, anti-submarine helicopter to replace the Wessex. Westland by this time had absorbed all the other British helicopter manufacturers to emerge as the sole survivor, financially, and industrially strong. The Sea King was the obvious choice and the now well established relationship between Westland and Sikorsky was continued, when a development contract was placed based on the SH-3D, to develop an ASW helicopter for the Royal Navy. 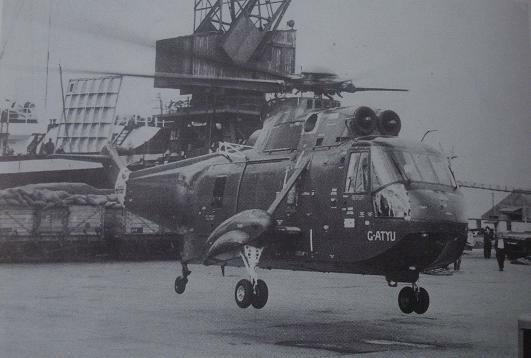 A single SH-3D prototype was ordered from Sikorsky; this arrived in the UK in October 1966 and was flown to Yeovil from Bristol Docks by Westland Chief Test Pilot Slim Sear carrying the British Civil Registration G-ATYU under the designation S61D-2. After some brief datum flying at Yeovil, it was laid up for conversion as the first development Sea King, serial No. XV370. Three more Sikorsky built SH-3D shells were acquired to become XV371, XV372 and XV373. The four aircraft formed the development fleet for the Sea King. The Sea King was to use the Rolls Royce Gnome 1400 with the Hawker Siddeley Dynamics electronic control system, the introduction of electronic control in itself offered a considerable improvement over the US SH-3 which even to this day struggles on with very inferior rotor governing. Westland undertook to build the whole aircraft including the transmission, gearboxes and rotor blades. Louis Newmark were again called upon to provide the Automatic Flight Control System, vital to anti-submarine operations, the Sea King installation was simpler than that of the Wessex 3 but has remained an important and reliable feature. The Sea King development programme was remarkably short taking only three years from ITP (Intention to Proceed) to Initial Release. Some of this is due to the fact that the aircraft type was acquired with MoD accepting a large part of the Sikorsky design and performance data and methodology. Not withstanding this acceptance of US data the development of the SH-3D into the definitive Sea King HAS Mk1 required an extensive programme to provide the British manufactured transmission, the Rolls Royce engine installation, the Autopilot and the definitive RN Radio and Sonar fit. There was only one major incident during the development programme this involved XV372 which suffered severe structural damage after engine flame-out brought about by ice ingestion. The aircraft was in fact en-route between Bristol and Yeovil and came down in the Mendips. At the time of the incident it was being flown by J L Barnes the Rolls Royce pilot and carried a crew of Rolls Royce engineers, the aircrafts principal task being engine installation development, the tasks were reallocated and XV372 never flew again. About the time that XV372 was lost there was a considerable amount of activity within the MoD and Westland to expand the test programmes to investigate and understand helicopter icing and trials with Wasp, Wessex and Sea King had already been planned with the intention of improving engine intake design and to undertake some cautious investigative flying into what, had always been accepted as a high risk area for helicopters. In the winter of 1970 Sea King XV642 was in Canada testing an experimental engine intake, which took the form of a heated mushroom shaped insert, intended to force a sideways airflow into the engine while presenting a forward facing heated surface. There was some limited success but insufficient to improve the overall icing release, ice protection for Sea King has remained dependent upon the ‘Barn Door’, which eventually was improved by the introduction of fluid anti-icing strips (TKS). This has allowed excursions into icing at temperatures as low as -10ºC and his has in itself been a major factor in many of the dramatic rescues which Sea Kings have been involved. The hot weather clearance was carried out in the USA at Edwards Air Force Base and Bishop, California, during the summer of 1970 with XV651. The first front line squadron was 824 which formed at Culdrose in February 1970. 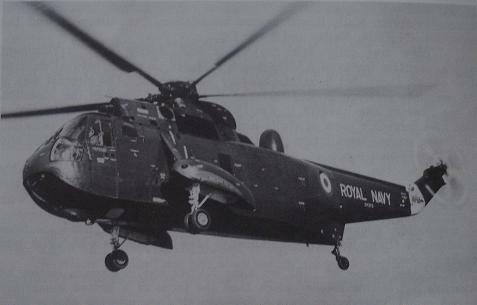 The success of these early marks of RN Sea King heralded a prosperous period for Westland, with substantial orders from Germany, Norway, Belgium, Egypt, Australia, Qatar, India, Pakistan and eventually even the Royal Air Force accepted that the Sea King might have some potential as a Search and Rescue helicopter. The most significant outcome of this active period was the development of the fixed landing gear Commando, which, after a protracted period was accepted by the Royal Navy for the Commando role to replace the Wessex HU5. The British Services gained considerably from the Sea King export programme many of the improvements originally requested by foreign customers found their way into the RN aircraft as modifications. XV370 still carrying its US Navy tail markings, undergoing datum tests prior to lay-up for conversion to Sea King. XV371 and XV372 airborne together, note the fittings for tied down running, in XV372 and the absence of a radome. XV373 undertook radio and navigation trials and much of the sonar system development.